« Tonight, Berlin is GNOME! Today, we’re announcing the start of the Desktop Summit t-shirt contest. We want designs that go beyond your typical conference shirt which finds its final resting place in the closet or drawer once you’ve returned home. We’re looking for designs that reflect the passion and energy of the Free Desktop communities that The Desktop Summit represents. The selected design will be made available for purchase to the 1000+ expected attendees. The money raised from the sale will be used to support The Desktop Summit. Please submit your design before 23.55 15th May UTC. See the rules for other submission details. The Desktop Summit is happening in Berlin from the 6th to 12th August. It is free to attend but you need to register. If you are attending you may want to subscribe to the discussion list to talk to others who are going, we also have the IRC channel on freenode #desktopsummit. Personally, I wouldn’t wear in public a T-shirt which shouts loudly “I’m working on “. Then again, I’m not a developer for any of these systems, so maybe actual devs feel more comfortable wearing such shirts. What I meant to say: I wouldn’t casually wear a shirt with “Gnome” or “KDE” written on it; but I _would_ wear a shirt with a little abstract foot or gear emblem which doesn’t openly say “even at the beach, I belong to the group”. Personally, I wouldn’t wear in public a T-shirt which shouts loudly “I’m working on Gnome or KDE or Windows or OS X or whatever“. Then again, I’m not a developer for any of these systems, so maybe actual devs feel more comfortable wearing such shirts. 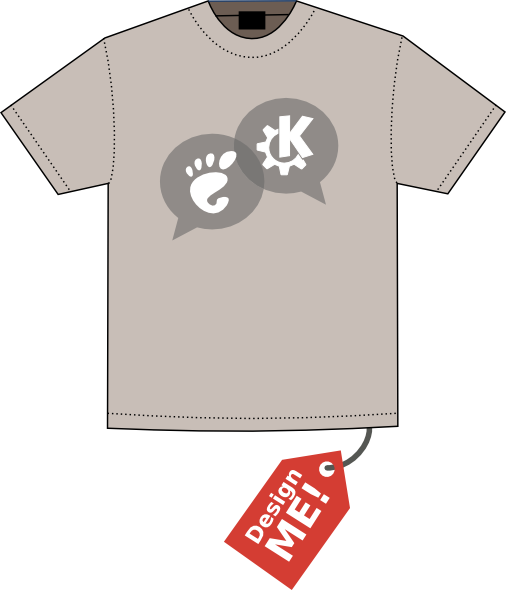 What I meant to say: I wouldn’t casually wear a shirt with “Gnome” or “KDE” written on it; but I _would_ wear a shirt with a little abstract foot or gear emblem which doesn’t openly say “even at the beach, I belong to the Gnome or KDE or whatever group”. sconces, chandeliers, ceiling fan lighting and different types of Home Remodeling.